The sheet is limited to 495 numbered copies. 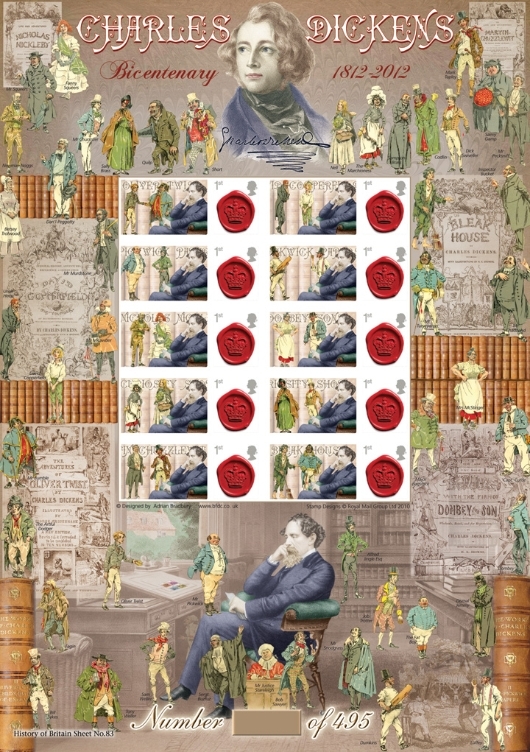 This stamp sheet marks the bicentenary of the birth of Charles Dickens on 7 February 1812. Dickens is generally considered the greatest novelist of the Victorian period. He enjoyed a wider popularity and fame than had any previous author during his lifetime. He remains popular having been responsible for some of English literature's most iconic novels and characters. Many of his writings were originally published serially, in monthly instalments, a format of publication which Dickens himself helped popularise at that time. Unlike other authors who completed entire novels before serialisation, Dickens often created the episodes as they were being serialised. The practice lent his stories a particular rhythm, punctuated by cliffhangers to keep the public looking forward to the next instalment. The continuing popularity of his novels and short stories is such that they have never gone out of print. My inspiration for the design of this sheet is from an unfinished watercolour which I have always admired titled:  Dicken s Dream by Robert William Buss. It is quite a famous picture which depicts Dickens surrounded by many of the characters he created.